This is a great time to be an introvert. We see articles and books popping up all over the place defining introversion, listings wonderful qualities of introverts, and making sure the extroverts know that introverts are just as good (and dare we imply, better?) than them. Introverts Unite (separately)! Introvert Power! 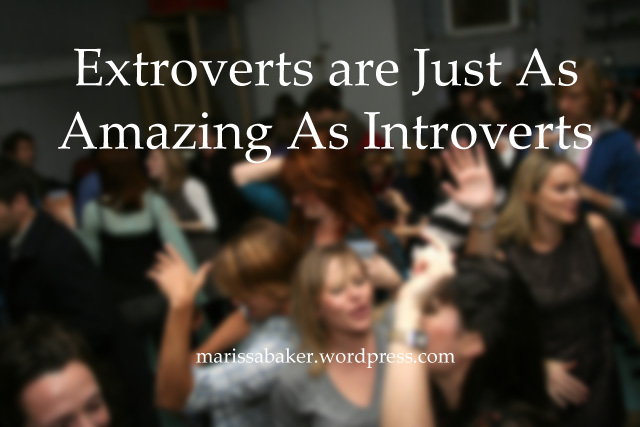 But I wonder when reading some of these articles if we’ve done the extroverts a disservice. Are we introverts in danger of taking our quest for recognition as extroverts’ equals to the extreme of thinking we’re “better than them”? If people could ever be balanced in a quest for equality, it should be those who study type theory. The very fact that introversion and extroversion is hard-wired into our brains should tell us that not everyone thinks the same, and that’s okay. So with that in mind, here’s a post for the extroverts. You’re awesome, too. Most of the introverts posts like this are addressed to extroverts with the goal of debunking myths surrounding introversion, so we’ll try and do something similar for assumptions we have about extroverts. Let’s get two things straight right from the get-go: introverts don’t have a monopoly on intelligence or sensitivity. Extroverts can be intelligent (and introverts can be unintelligent). Extroverts can be sensitive (and introverts can be insensitive). In fact, the Sensory Processing Sensitivity trait is independent of introversion and 30% of the people who qualify as Highly Sensitive are extroverts. At least two of my extroverted friends are HSPs, and even the ones that aren’t are way more in-tune with their own and other people’s feelings than most introverts give them credit for. Often, the extroverts who tell introverts that we can “recover” from our introversion think this because they were shy as kids and assume “introvert” is the same thing they experienced when they were shy. Shyness is not the same as introversion, and it isn’t an uniquely introvert phenomena. Extroverts can also suffer from shyness and social anxiety. It might actually be harder for them, because at least as a shy introvert you are oriented to living inside your head, whereas an extrovert who is shy wants to be around people but is also terrified of them at the same time. I recently saw someone ask what the world would look like if introverts were in charge. Most of the responses (all from introverts) were along the lines of “peaceful,” “harmonious,” and “quiet.” The first thing I thought? Nothing would ever get done. We’d be so busy trying to avoid conflict that the world would fall apart. As a society, we need extrovert’s energy to connect people, force conflict resolutions, advocate for change, and step-up as leaders. Can introverts do that? sure. But many extroverts thrive in those roles and find that it comes naturally to them. This should be obvious, but even for those of us who know deep-thinking extroverts there can still be an assumption that most extroverts just word-vomit whatever pops into their heads and dash through life acting instead of thinking. Granted many extroverts do love to talk and sometimes words get out that haven’t gone through a filter yet, but that doesn’t mean they don’t think deeply about things. 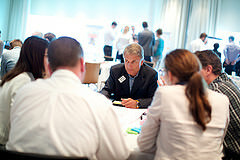 If you’ve spent any one-on-one time at all with an extrovert, it quickly becomes obvious that they aren’t all shallow. Most of my closest friends are extroverts, and I’ve learned to value their insights and thoughts on a wide range of subjects. If you’re an extrovert, what is it that you wish people understood about you? If you’re an introvert, what do you love about the extroverts in your life? Yeah me!! Extroverts can be misunderstood too!! In answer to your closing questions I wish people understood that I need time alone and quiet – it recharges me just as much as being with people does, not every moment can be party time! Wonderful post by a wonderful blogger. 🙂 I think this very issue causes so much confusion for people when they try to type themselves; leading to thinking that they’re both, or neither. Shy extrovert over hear. My social anxiety & shyness is not severe, but it is so pervasive that I consistently type as an INFP.